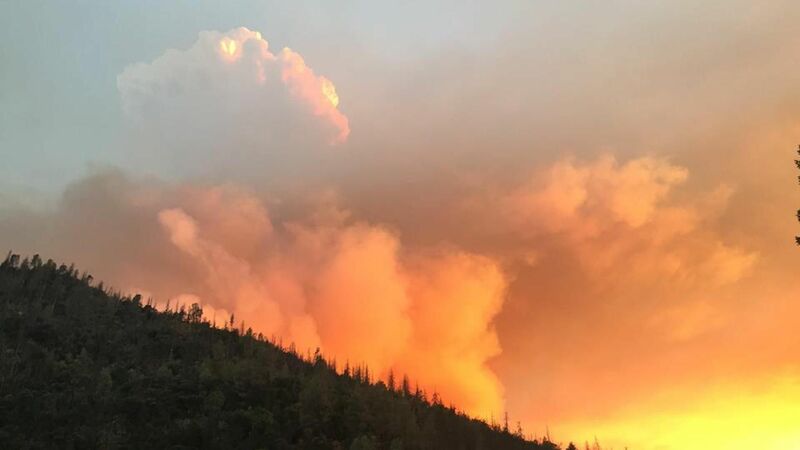 The deadly Ferguson Fire is burning on the western edge of Yosemite National Park, shutting down one of the access roads during the height of the tourist season. The big picture: Ferguson, which started Friday and has claimed the life of one firefighter, is one of 56 large fires currently burning across the country in a season that has already charred more than 3.3 million acres, slightly above the national average-to-date. Threat level: As of Monday morning, the Ferguson Fire had burned 9,266 acres, and was just 2% contained. The weather forecast for the region does not bode well for firefighters, as continued hot weather with scattered thunderstorms is likely during the next week. While these storms could bring some beneficial rains, they're more likely to ignite new fires from lightning strikes. The fire's quick escalation was visible from space, with smoke pouring into the iconic park. The wildfire's proximity to Yellowstone is particularly concerning for firefighters and the National Park Service since the smoke threatens to worsen air quality in the park and limit visibility. Depending on its growth, the Ferguson Fire could also block more entrance routes and work its way closer to the center of the park. The bottom line: The Ferguson Fire is going to be extremely difficult to extinguish, since it's burning in rugged terrain where trees have been ravaged by drought and insect infestations, leaving a ready supply of fuel for the fire to burn. Last year was California's worst wildfire season on record, and the state is going into the heart of its wildfire season mired in unusually dry and hot conditions.